The Bartolomeo is wonderful, but the illustration from the NYT has considerable charm too. the key or legend in the lower left of the last panel nicely captures the “single bullet theory” of what happened when Satan got shot out of heaven (Satan himself being the bullet). 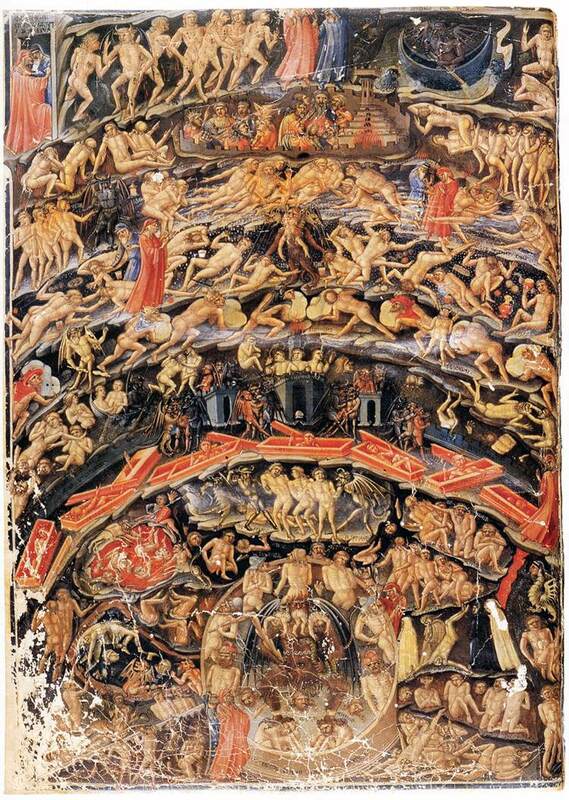 All the material from the impact crater caused by his fall pushed out the mountain of purgatory; in effect, then, hell, purgatory and Eden were all created simultaneously. Now the physics here looks pretty suspect, but then lots of people also say that about the Warren Commission conclusions. Ockham’s razor makes the single-bullet theory terribly appealing, but isn’t that a case of the Manicheistic heresy? (See James Blish’s A Case of Conscience for further details.) But what created the secret passageway? Did a hangnail fall off of Satan and drill it? And why didn’t they take the secret passageway in the first place and work backwards so that the movement of of the poem was unidirectional, from the Antipodes to God? I see some have suggested that the sound they are following is the river Lethe! Very interesting, that. 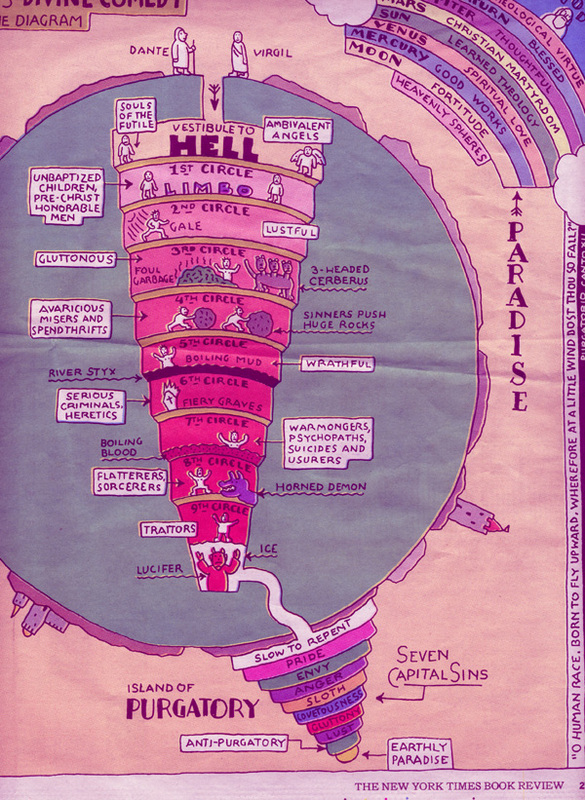 I’m not a Dante scholar, but it was my understanding that the island of Purgatory is the antipodes of Jerusalem. Whether Jerusalem stands over the site of Satan’s crash is another question, I suppose. And at the risk of being even more pedantic, isn’t the movement of the poem already unidirectional? They pass down through the Earth, emerge on the other side, climb the mountain, and go into the sky, which is directly above the Earth’s surface, even at the antipodes. The drawing makes it look disjointed, but the drawing forgets that not only is the world round but also the heavens. So to speak. Fair point, fair point. Morally unidirectional might be the better term. Which is to say in the pursuit to give increasing intensity to each of the three sections, with the appearance of Satan, Beatrice, and God at the end of each (Beatrice a bit before the end), the parallels create the odd fact that Satan makes his appearance at the 1/3 mark. Odd to me, anyway. It is an odd decision–and an intentional one, I suspect. There are 2 things in play here. The second thing is Beatrice. 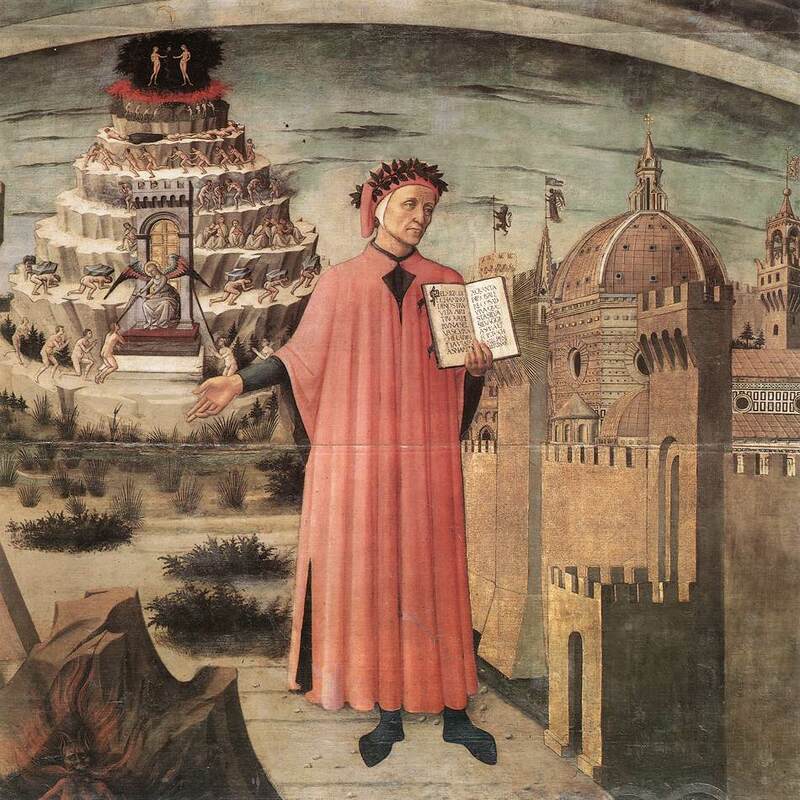 Dante was willing–and I love this about The Divine Comedy–to insert his personal relationships into the vast canvas of his epic. This is the truly odd and awe-inspiring decision. The poem’s ambition is unlimited–some think he believed he was contributing another testament of the Bible–and also perversely minor. Part of that perversity was a conviction that Beatrice was in fact a major figure in Heaven, and the Divine Comedy was his way of making that truth known. Her position in the Purgatory book, at the point where Satan and God appear in the other books, tells us that if we aren’t excited to see her, we should be.